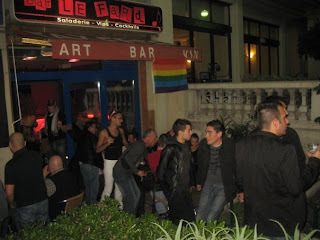 Le Fard is fun, boutique style, 'before' bar that you should really check out if you are visiting Nice. Since it opened in 2007, Le Fard is where everyone seems to go before heading off to the bigger nightclubs. At times they will even promote themselves as the “before” place to attend, as will other clubs with their cross-promotions in Nice. Yet if you’ve ever been there you’ll notice people are enjoying themselves so much they can’t seem to tear away from the place, many people will just stay and make a night of it. I’ve definitely seen plenty of parties start and end here. Le Fard is in one of the best spots in Nice. Directly across from the beach at: 25 Promenade des Anglais. 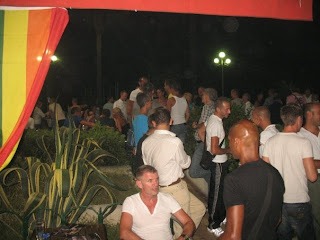 Making your way down the Promenade des Anglais, you’ll start to hear the music playing and come upon groups of gorgeous men having drinks out front of the establishment, that’s when you’ll know you are at Le Fard. The inside of Le Fard is certainly not huge but it’s comfortable and colorful, one of the best parts about it though is the crowd and staff are both attitude free. This is a very easy place to meet new people if you are traveling on your own. In the heat of the summer, it’s nice to be able to get a drink inside and then relax out front in the courtyard with the other patrons, cooling down with the fresh evening breeze coming in off the sea. During the winter months, it’s not unusual to find everyone heating up by socializing inside, making it a winning situation anytime of year. Le Fard is open Monday to Sunday from 6:30pm-2:30am. 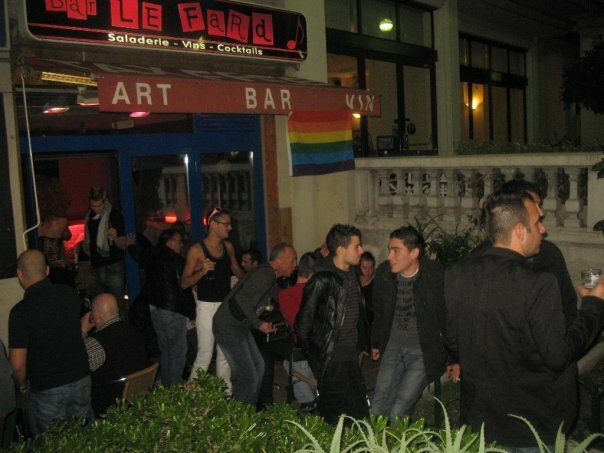 Be sure to stop by Le Fard when you are in Nice. Update: Unfortunately Le Fard is no longer in business.